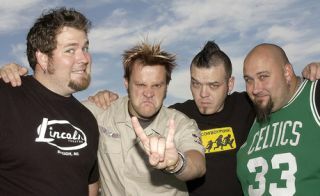 Earlier this week Bowling For Soup drummer Gary Wiseman told us all about how the band is battling the economy. Now, he's filled us in on the band's brand new album. We grabbed some time with the sticksman as the pop punkers ready their latest record. You guys have a new album on the way, how's that coming along? "We finished recording a new record in June and we're waiting to put that out. After this tour we're going to go home and have a little break for the holiday and then my first child is being born in January so we'll have a little bit of time for that and we'll have the record out early next year and start touring that. We were supposed to have a tour in November and December but it fell through so we're going to take some time and enjoy it with our families." "We recorded it in Dallas. It was a little bit of a different process. Every other record we've done in the last ten years we've worked up the songs together and everyone has known what we were doing before we went into the studio. This time we showed up to the studio and had just heard little snippets, we'd never played them before, we'd just heard Jaret (Bowling For Soup singer's) demo. "We basically went in and made the songs happen in the studio and they turned out really, really cool. It was a lot of fun doing that. Usually we've already worked them up as a band so you know what it's gonna sound like whenever you finish it, but you couldn't see that this time. We did drums first, then guitar and the songs had to be built in the studio." Did you try anything different with your drumming? "It was a different studio but we weren't trying to reinvent the wheel. We wanted it to sound like a Bowling For Soup record. We weren't going too crazy." "It was an old Ludwig. Then we also switched around a million different snare drums for this and that song."